You may not have heard of Bentrice Jusu - yet - but you owe her a debt of thanks. The artist, who describes herself as a performer, musician, poet and photographer, has just pulled off a minor miracle: bringing sunlight to her community during a period of darkness. 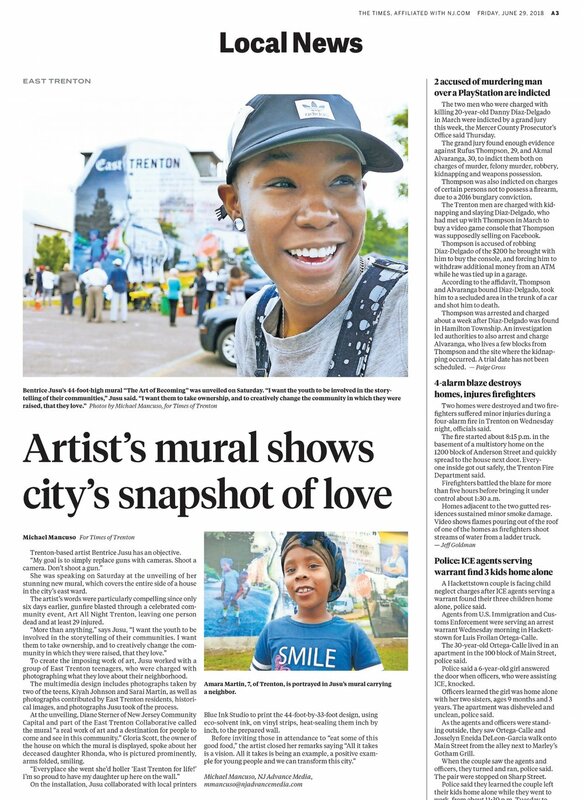 Six days after gunfire echoed through Art All Night, killing one person, injuring 22 people and adding a somber note to Trenton's signature cultural event, Jusu unveiled her gift to the capitol city. It's in the form of a huge photo montage covering the entire side of a house at the intersection of North Clinton and North Olden avenues. If you're driving or waking anywhere in the vicinity you can't miss its bright colors and uplifting message. The mural is the combined work of East Trenton teenagers, enlisted by Jusu to capture elements that they love about their neighborhood, as well as photos contributed by residents, historical images and pictures Jusu took as the artistic project was under way. The home bearing the colossal artwork belongs to Gloria Scott, whose daughter Rhonda was killed in Camden five years ago. A smiling Rhonda has a cherished place on the mural. "Every place she went, she'd holler, 'East Trenton for life," Scott said at a ceremony marking the mural's unveiling. "I'm so proud to have my daughter up here on the wall."